Following up on a tip from Klaas I bought ‘Brilliant Orange’ by David Winner. I love books by non-Dutch authors about Dutch culture – they see things I cannot see. Klaas brought the book to my attention because it deals with meta-perception, and why seeing things ‘from above’ comes natural to Dutch people. It turned out to be a real page-turner, and has a great quote on that moment that meta-perception and perception blend into one and perception becomes immersed in the intricacies and challenges of the game. Quotes from the book: Page 26 “The Dutch are at their best when we can combine the system with individual creativity. 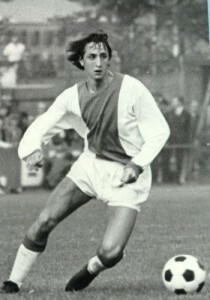 Johan Cruyff is the main representative of that. He made this country after the war. I think he was the only one who really understood the sixties. Page 29: At around the same time Holland’s most celebrated and original architects, the so-called structuralists, were rebelling against the dreary precepts of functionalism and modernism with open-hearted but efficient, flexible, aesthetically playful buildings that abolished rigid hierarchies. “All systems should be familiarised, one with the other, in such a way that their combined impact and interaction can be appreciated as a single complex system’, said key structuralist Aldo van Eyck, talking about modern cities but sounding uncannily as though he might be laying down a template for the Ajax football system. Page 47: The football pitch is the same size and shape everywhere in the world, yet no one else thought about football this way [in terms of spatiality and arithmatics]. So why did the Dutch? The answer may be that the Dutch think innovatively, creatively and abstractly about space in their football because for centuries they have had to think innovatively about space in every other area of their lives. Because of their strange landscape, the Dutch are a nation of spational neurotics. On the one hand they don’t have nearly enough of the stuff. 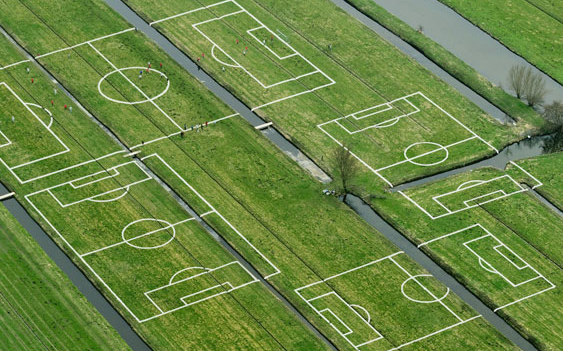 Holland is one of the most crowded and most intensively planned landscapes on Earth. Space is an extraordinary precious commodity, and for centuries the use of every square centimetre of every Dutch city, field and polder has been carefully considered and argued over. The land is controlled because as a matter of national survival it must be. 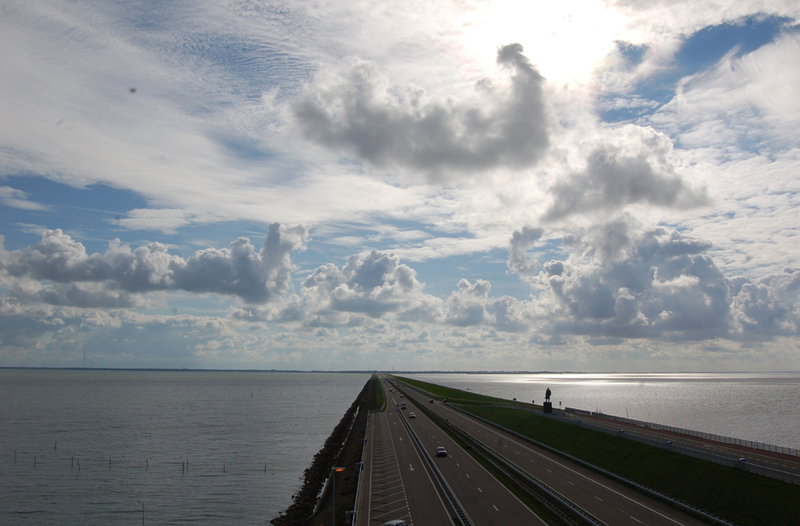 The Dutch water system has to be regulated tightly because more than fifty percent of the country is below sea level. The land the Dutch made for themselves is extremely odd. “We live in a complete knot of artificialness”, says influential landscape architect Dirk Sijmons. “What is nature and what is artificial? You can’t say. The landscape is an abstraction in the sense that it is only points, lines and surfaces, like a painting by Mondriaan. Page 52: The man-made character of Holland is reflected in all areas of life, from the way the Dutch deal with nature and the environment to the design of its cultural institutions and a concern for democratic consensus building. In Holland the open sky and the open mind go hand in hand. Page 53 To make sense of the vast flatness of their land, Fuchs says, the Dutch developed a way of calibrating distances from the horizon, calculating space and paying meticulous attention to every object within that space. 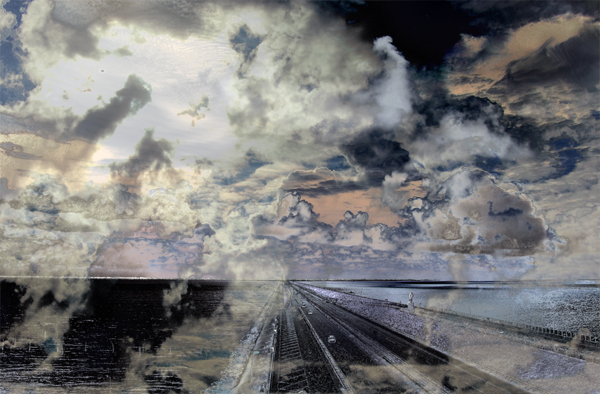 Dutch art thus developed an extraordinarily precise and reverent approach to this reality. Page 70 71 That is also about being part of a system larger than you .. the car becomes you. You can only drive it when you don’t know the rules any more, when you forget everything they taught you. Every time you turn a corner, you don’t get out of the car to measure the curves and then go back into the car. You do everything blind because of the system, the road and the other cars, which are part of the system too. .. And that’s the moment when you are ‘in form’ in both senses. It feels good and there is this whole hectic feeling of extension into the world that is being ‘informed’. This is the thing Gadamer talks about, too, see my blog on his essay ‘the relevance of the beautiful: ” … states that to appreciate a work of art is likewise an active event, an act or a being in-play with the work, an act that one’s consciousness can surrender to and participate in. Full participation requires immersion, reduces and enhances perception to a point that it cannot be fully anticipated or controlled by the individual consciousness. Both the game and the work of art are forms of self-movement which require that the spectator play along with what they bring into being. 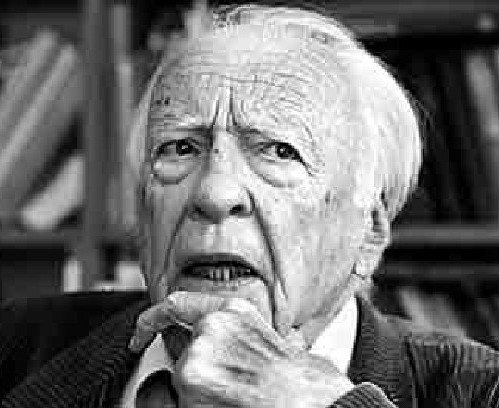 Gadamer asserts the “primacy of the play” over individual consciousness: “the players are merely the way the play comes into being.”. Participation is never individual: a game takes both the player and the spectator out of herself and makes her part of a larger whole.